Plessey, a leading manufacturer of lighting and sensing products and components, has been shortlisted in the Healthcare Technologies category for its imPulse ECG monitor at The Institution of Engineering and Technology (IET) Awards 2016. The prestigious annual awards celebrate the best innovations from both industry and academia and highlight landmark work and developments that take place across a number of important areas of science, engineering and technology. Plessey’s imPulse hand-held device utilises the company’s patented and award winning EPIC sensing technology. Plessey’s EPIC disruptive technology has uses in the medical, automotive and industrial market segments. This sensor technology has been creating considerable interest within the medical community where the primary focus has been in using EPIC for surface body electrode physiology applications such as electrocardiograph (ECG), electromyograph (EMG), electroencephalograph (EEG), and electrooculography (EOG). 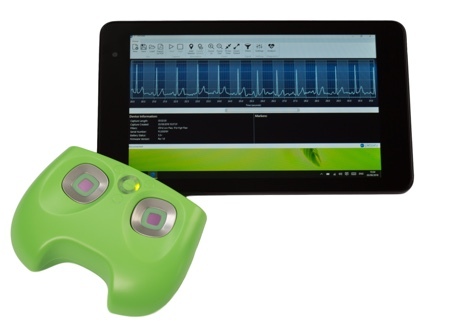 in the imPulse sensor Plessey has developed a simple-to-use hand-held ECG monitor. Utilising Plessey's disruptive Electric Potential sensing technology to detect an ECG signal, all that is required is the simple placement of the thumbs on the sensors embedded in the imPulse unit. This allows for a routine, quick, accurate recording of a lead one ECG signal without the need for conductive gel or skin preparation. The signal is transmitted using Bluetooth to a Smartphone or Tablet computer and displays the ECG trace along with heart rate readout and provides a simple output indicating whether the user is at risk of atrial fibrillation (AF) a precursor to a stroke. Winners of the IET awards will be announced at the award ceremony taking place on Wednesday 16 November at The Brewery, London.